A delightful, one bedroom cottage with a loft . 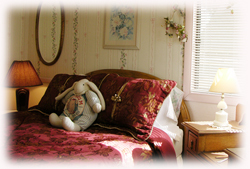 The bedroom has a queen bed ; decorated in pastel colors and has fluffy pillows and a down comforter. The loft accommodates children comfortably on a futon that is made into a bed on the floor. The shelf along the front of the cottage displays antique bears, toy, and rag dolls that Pat has collected. Breakfast foods are in the cottage for you to enjoy at your leisure. 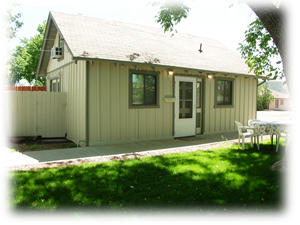 There is a yard with a picnic table, lawn furniture, and a gas barbeque for your pleasure. The living room has french doors opening onto a small private patio. It is delightful to sit out at the table, drink wine, and enjoy the stars on a summer night! This cozy and romantic cottage is a favorite for honeymooners! 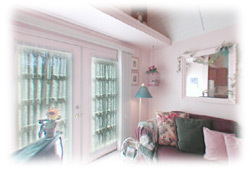 710 W. Birch - a delightful little breakfast nook A romantic bedroom, with a queen bed accented with pastel pinks and light greens, this cottage is perfect for special getaways! Your hosts, Pat and Ed may surprise you with wine and other special treats. 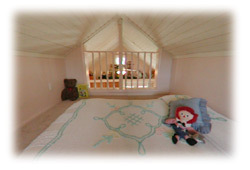 710 W Birch - A relaxing and intimate bedroom Upstairs is the loft, especially for children. Equipped with it’s own toy box, the loft has a thick mattress, made into a comfortable double bed on the fully carpeted floor. Children love this loft! !